Today our expert guest is Adam Capes, the co-founder and President of Getaway2Give. Adam is a social entrepreneur helping people create amazing vacation experiences, while changing the world of fundraising as we know it. Adam has been passionate about raising money to help people since was in first grade, when he had a backyard fair to support individuals diagnosed with Leukemia. That experience gave him a high he had never experienced before, and it inadvertently taught him that the act of giving is actually as psychologically gratifying (if not moreso) than the act of receiving. 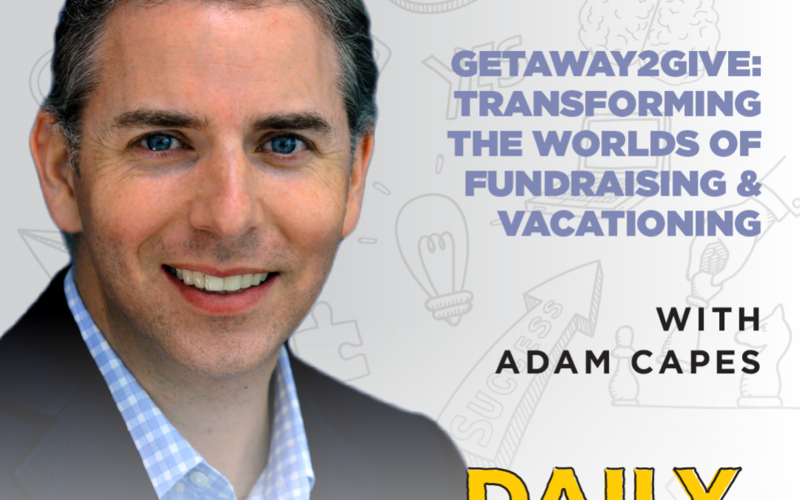 What Adam found is that one of the most effective strategies for fundraising is providing unmatched, memorable vacations. So, at Getaway2Give, they give people a white-glove concierge experience – a personal Guest Experience Manager helps plan the details, then a Destination Manager greets guests on site and makes certain everything goes as planned throughout the entire experience – in return for a charitable contribution that supports others who really need help. Although this style of fundraising has typically only been part of charity fundraisers, Getaway2Give offers packages to anyone looking to go on a great vacation, without doing all of the work that’s often involved with going out of town.